I l grew up on Eucerin. My mom always had it in the bathroom cabinet when I was growing up. 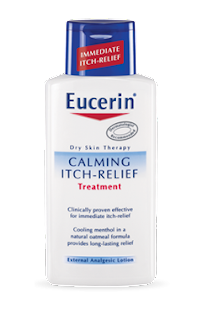 Whenever we had dry or itchy skin, out came the Eucerin. I haven't used Eucerin in many many years, but just recently I'm glad I had it handy. So these last couple weeks since I"ve been pregnant I've had dry flaky patches of skin all over my face, and I found out I have a bit of rosacea. Or at least that's what I think it is. My skin is so irritated and dry, it's almost like a nasty sunburn. It's been happening for a while now and I couldn't figure out what was going on. I had no idea what to use to make it better, until I talked to my mom on the phone and she said "Try Eucerin!" What a coincedence, it just so happened I was getting ready to write a review on all my Eucerin Calming Products, and I thought this would be the perfect time. 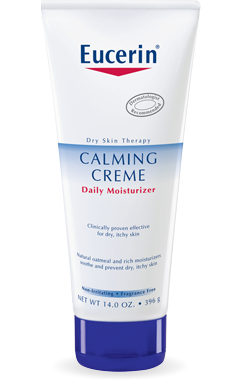 I first thought to try the Calming Creme Moisturizer. I was a little iffy because my skin was SO irritated and I didn't want to make it worse. But my mom was telling me a story about how her best friend has eczema and she can only use Eucerin products, nothing else. So I gave it a go. I can honestly tell you that as soon as I applied the lotion, I felt a soothing calm relief on my face. The redness went away a bit, not completely but the irritation was gone. The worst part of the rosacea is the itching and burning feeling that goes along with it. The Calming Creme took the pain away completely and I felt I could go out in public again. Needless to say, it was my lifesaver! Of course it can be used all over your body and not just your face. Arms, legs, neck, wherever you have dry flaky skin, Eucerin works! Of course it's not going to make the problem go away, and it's not a miracle worker, but it does give you relief and made the redness not as noticeable. So after a couple hours, I tried the Calming Itch Relief Treatment on my face because my face has been not only red and irritated but itchy! And of course itching makes your face more red when you scratch, and it's SO uncomfortable. The formula is meant to last up to 8 hours and like all other Eucerin products, it's free of all chemicals and dyes. So when I applied the itch relief it did work. It didn't take away the redness like the moisturizer, but it did help. It also contains Colloidal Oatmeal which is good for soothing your skin. The Calming Body Wash is a daily shower oil meant to cleanse your skin without drying it out. Not something I used on my face, but something still meant for skin in need of some serious nourishment. Keep in mind this is meant to moisturize, so it has no fragrance or dyes and it won't lather, but it will get the job done. After my shower, my skin felt great and I didn't even need to put a lotion on, which is something I always do as soon as I get out of the shower. 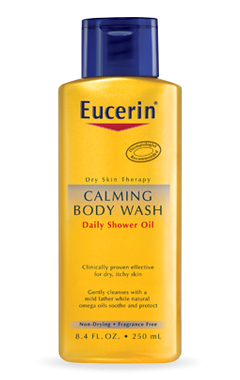 Overall, the Eucerin Calming Products do just that. They calm your skin, and it's perfect for rosacea, eczema, dermatitis, sunburns and all other annoying skin issues. I've been applying all these products on right before I go to bed to calm me down a bit after a long day and I feel more relaxed and ready for sleep. All the above is also great for children as long as they are over 2 years old. I guess my mother was right all along, Eucerin works. And what's the best part? One winner is going to win all 3 products plus a $50 Gift Card! I have some problems with inflammation on my skin too. Plus my husband seems to be getting dryer skin the older he gets. He wakes me up scratching in his sleep! Would love to try Eucerin to see if it works for us..thanks so much for the chance! My Grandma was a nurse and would always use Eucerin because she washed her hands all the time and they were and I remember my grannys hands were always soft and so I also grew up with Eucerin. I GOT A SAMPLE A LONG TIME AGO, PLUS A COUPON. THE ONLY THING I DON'T LIKE IT'S THE PRICE AT THE STORE 4THE LOTION, IT'S A LITTLE EXPENSIVE 4MY BUDGET, BUT I LOVE THE LOTION. So excited for the win. Got my prize package today and LOVE the products!